These workshops offer the public the opportunity to voice thoughts on the changing dynamics in the Lake Ontario region and how those changes may impact their communities, their businesses, the environment, and boating, fishing and other recreation interests, says workshop organizer David B. MacNeill, New York Sea Grant, Oswego. Lake and watershed planning informed by grassroots wisdom along with input by experts in climate, natural resources, and other fields will help communities be better prepared to adapt to the challenges of an uncertain future, says New York Sea Grant Associate Director and Cornell Cooperative Extension Assistant Director Katherine Bunting-Howarth, Ithaca, NY. Seating is limited for the November 10 workshop at Cornell Cooperative Extension Jefferson County, 203 North Hamilton Street, Watertown. The November 12 workshop in Rochester will be held at the Rochester Museum and Science Center Bausch Auditorium, 657 East Avenue, Rochester. Doors open at 6:15pm for each workshop. Registration is recommended by calling New York Sea Grant at 315.312.3042, slm22@cornell.edu . The watersheds included in the Great Lakes Integrated Sciences and Assessments project in New York State are: Black, Buffalo Eighteenmile, Cattaraugus, Chaumont Perch, Chautauqua-Conneaut, Conewango, French, Indian, Irondequoit Ninemile, Lake Erie, Lake Ontario, Lower Genesee, Niagara, Oak Orchard Twelvemile, Oneida, Oswegatchies, Oswego, Salmon Sandy, Seneca, Upper Allegheny, and Upper St. Lawrence. New York Sea Grant is a cooperative program of Cornell University and the State University of New York is one of 33 university-based programs under the National Sea Grant College Program of the National Oceanic and Atmospheric Administration. Through its statewide network of integrated services, NYSG has been promoting coastal vitality, environmental sustainability, and citizen awareness about the State’s marine and Great Lakes resources since 1971. 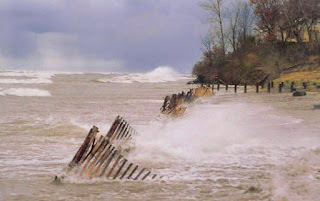 0 Comments to "Public Input Sought on Future Lake Ontario Weather Extremes; Workshops November 10, 12 "